Last night I came home from class to find a package on my front door step. 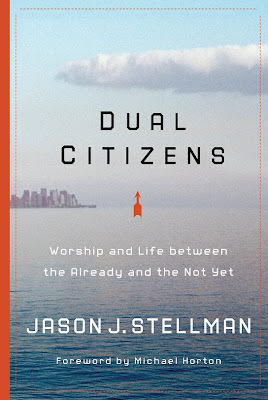 At first I had no idea what was in the box, but once I saw the return address I knew it was my review copy of Dual Citizens: Worship and Life Between the Already and the Not Yet by Bring the Books very own, Jason Stellman. When I opened the package I was pleasently suprised that this new volume was printed in hardback. I look forward to cracking this one open and seeing what Stellman has to say about living as an exile in this world. Dr. D. G. Hart has the following to say about this new book from Reformation Trust. The subject of Christ and culture has never been as popular among conservative Protestants in the United States as it is today, and the topic has never needed as much attention from the perspective of the church. It gets that attention in this important book by Jason Stellman. Dual Citizens will certainly upset those used to thinking of Christ as mainly the transformer of culture. But for genuine wisdom not only on the culture wars, but on the culture, ways, and habits of the church, Stellman's discussion is the place to go.